Dillon-Peterson Essay Contest Deadline is November 30, 2018! Time to sharpen up those pencils and put on your thinking caps! The deadline is fast approaching for the annual Gordon W. Dillon - Richard C. Peterson Memorial Essay Contest. Don't wait until the last minute. The contest is open to all persons except employees of the American Orchid Society and their immediate families. You do not need to be an AOS member. The winner receives a cash prize and a certificate suitable for framing. 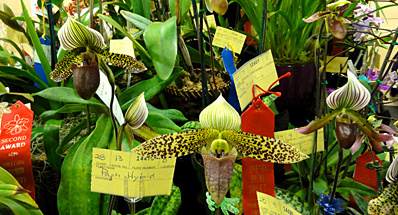 The contest was established in 1985 by the AOS Northeast Judging Center to honor the memory of two former editors of the AOS Bulletin (now Orchids). Gordon Dillon served as editor from 1943 through 1968 and again from 1970 through 1973. Richard Peterson's name first appeared on the masthead of the AOS Bulletin in April 1971 as associate editor. In 1973, he was named editor and, upon Dillon's retirement in 1977, he became the executive director, retaining his position of editor through 1984. The theme for 2018 is: Bells and Whistles: Ingenuity and the Orchid Grower. Orchid growers are famous for devising ways to accommodate their charges on the windowsill, under lights and in the greenhouse. Maintaining tropical plants in a desert climate, cool-growing plants in a tropical climate or warm-growing plants in subarctic conditions all demand ingenuity that you can share with readers of the ORCHIDS magazine . The winning entry (if any) will be published in the June 2019 issue of ORCHIDS at the discretion of the editor. The winner of the prize will receive a cash award supported by the dividends and interest on an endowment from the Northeast Judging Region. The essay must be an original, unpublished article. The contest is open to all persons except employees of the American Orchid Society and their immediate families. Submissions must be no more than 5,000 words. Manuscripts must be submitted in English and should be submitted electronically as MS Word or compatible word processor file. Submissions will be judged without knowledge of the identity of the author. The decision of the judges is final. If no entries meet the expected criteria of excellence, the award will be withheld. Artwork is not necessary for entering this competition. Nonwinning entries will be returned to the contestant if requested. Such entries are eligible for resubmission in subsequent contests. These nonwinning entries will also be considered for publication by the editor of ORCHIDS and may be used in ORCHIDS or other AOS publications with the written permission of the author. Published entries will not be eligible for consideration in subsequent contests.